The cost of ineffective corrective action can be astronomical when you consider the monetary and reputational impact of delayed problem-solving. On a small scale, repeat problems—even minor errors—send a message to customers that you just don’t care to get it right. And when poor problem-solving leads to more significant quality escapes? You could be looking at $10,000 per minute from the customer in line stoppage charges, or even a $10 million dollar recall. To ensure corrective actions reduce risk, automotive and aerospace suppliers need to avoid key mistakes around measuring effectiveness, root cause analysis and tracking closure. Most often, corrective actions fail because companies fail to measure their effectiveness over time. This is true for individual corrective actions as well as for the corrective action process as a whole. After a corrective action is complete, you need a way to determine not only whether it was effective, but also whether you’re holding the gain. Layered process audits (LPAs) are an ideal tool for this type of ongoing verification, with daily audits providing many opportunities for checking high-risk areas. Another major barrier to continuous improvement is ineffective or “check the box” approaches to root cause analysis. Frequently you have someone in an office doing the analysis, blaming every problem on operator error with training as the easiest solution. Instead, organizations need to make problem-solving a team effort that actually involves people on the shop floor with first-hand knowledge of the issue at hand. Just as important, you need to be willing to ask hard questions and take an honest look at the answers. One way to get to the root cause is to use the ‘5 Whys’ analysis, in which the management asks ‘Why?’ after an answer regarding the root cause to an issue. This interrogative technique is used to fully see the cause-and-effect relationships underlying a problem. Its only when you see the full picture that you get to the true root of quality issues. The third reason why corrective actions fall short is failure to translate lessons learned from corrective action to other sites, products and processes. It may be cheaper to skip the follow-through, at least in the short run. But ultimately, the price of letting problems become systemic is far steeper, impacting your most important client relationships and even the business as a whole. Taking too long to fix problems is not something regulators tolerate, imposing millions in fines to individual companies for failing to fix problems in a timely manner. While it’s true that some complex issues can take weeks (or longer) to correct, it’s critical to recognize that delayed closure times increase the risk of quality escapes. In fact, average time to closure for corrective actions is often a leading indicator of quality problems. Leading indicators are metrics that point to what might happen in the future, compared to lagging indicators that measure results. As an example, you might notice that customer complaints (a lagging indicator) start creeping up when average time to closure goes up. Making this connection means you can take action to keep time to closure as low as possible—before problem-solving delays translate into customer complaints. Many organizations still use manual or paper-based approaches to managing corrective action, which creates many opportunities for requests to get delayed. Closing the loop through automation can eliminate many of the problems discussed here and set the foundation for a culture of quality. An authentic commitment to solving problems is at the heart of quality culture, making corrective action a high-impact area where small changes can lead to big results. Shawn Faircloth has been a customer-centric business development leader and account executive for Ease, Inc. since 2011. We’re reshaping the world of archaic paper-based processes like layered process audits (LPAs), 5s, HSE, internal audits and corrective actions through our intuitive mobile application, Beacon Quality. 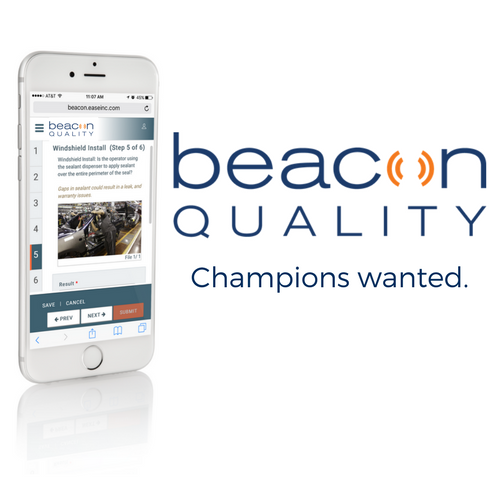 Designed to meet the quality and compliance challenges of the automotive and aerospace industries, Beacon Quality is helping manufacturers bring mobility to the shop floor; create a culture of quality, integrity, & transparency; and obtain real-time insights.